This is by far one of my favorite breakfast meals to have. It’s a healthy and nutritious start to the day and packed with tons of flavor. This is also by far one of the easiest things to make with a total cook time of 10 minutes including prep work. First begin by gathering together all ingredients needed for the recipe. Next wash apple and slice it. 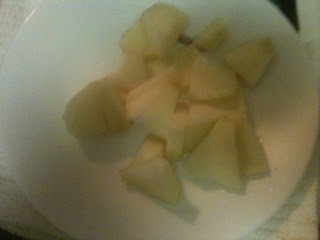 You will only need about half of the apple so set 4 wedges aside (sprinkle a little lemon juice over apple if it begins to brown). Using a peeler or sharp knife peel skin and chop up apples. Put a saute pan on medium heat and spray pan. Add in apples and saute for a minute or until they begin to soften ( make sure to lower heat if you see apples begin to brown) If you ever made apple pie you might notice that this is very similar to how you might prepare the apple filling however, I prefer to spray the pan rather than use butter, but feel free to add butter to make a thicker apple filling. 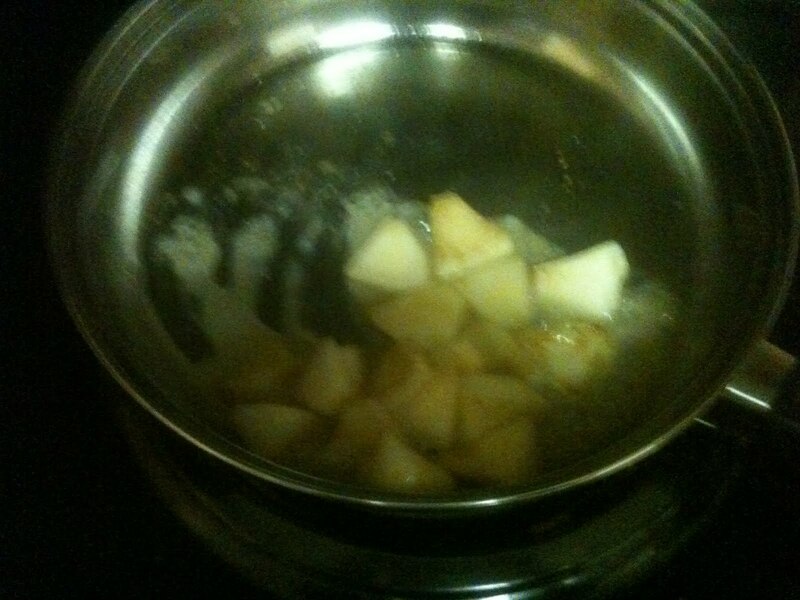 Once you see that apples have softened mix together cold water and cornstarch thoroughly and add to the saute pan. 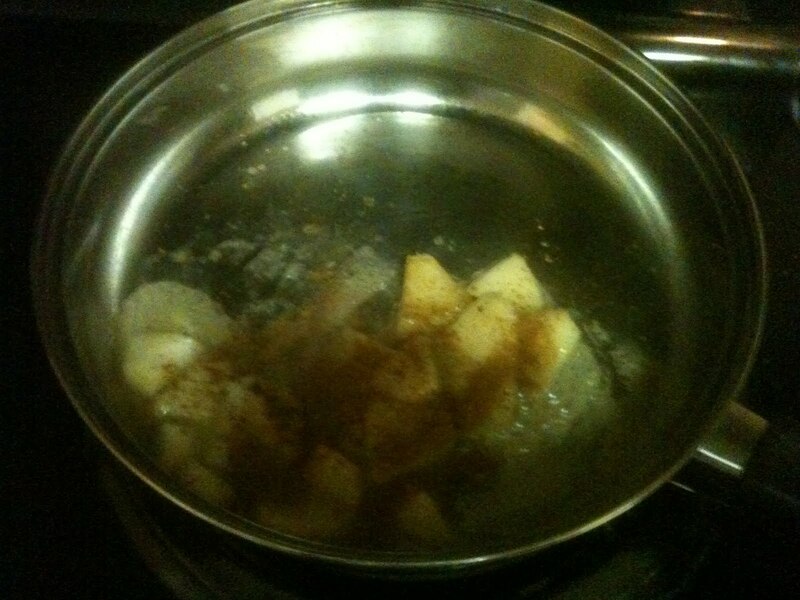 Add in cinnamon, nutmeg, and maple syrup. 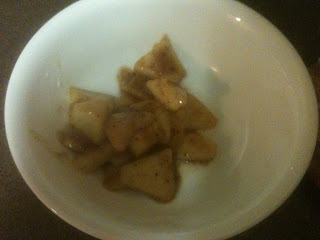 Make sure apples are well coated and saute for another 30 seconds to a minute. At this point you probably have an amazing cinnamon spiced aroma in your kitchen, if your like me you might even be ready to dig a fork into the sauteed apples and forget the rest of the recipe, but resist the urge, I assure you in the end you’ll be happy you did! 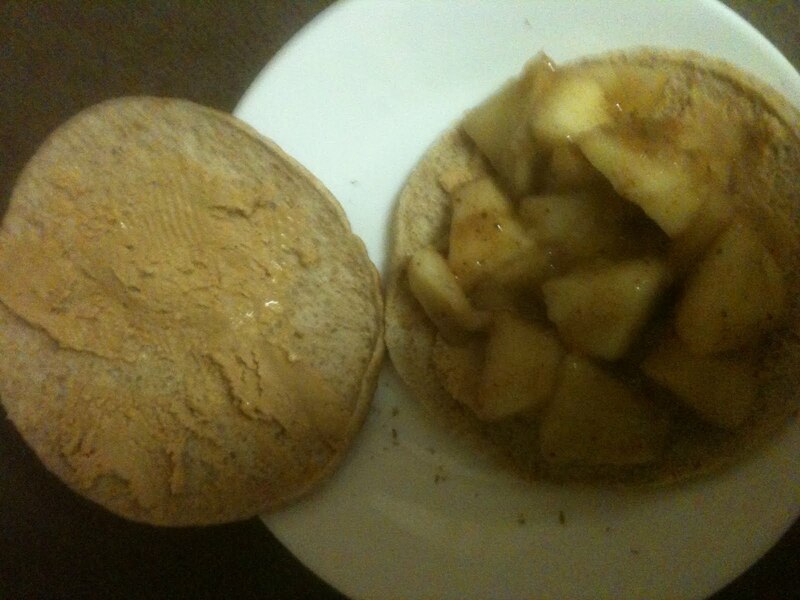 Instead set apples aside in a bowl and prepare the rest of the sandwich. Using a knife evenly spread cashew butter on bread. 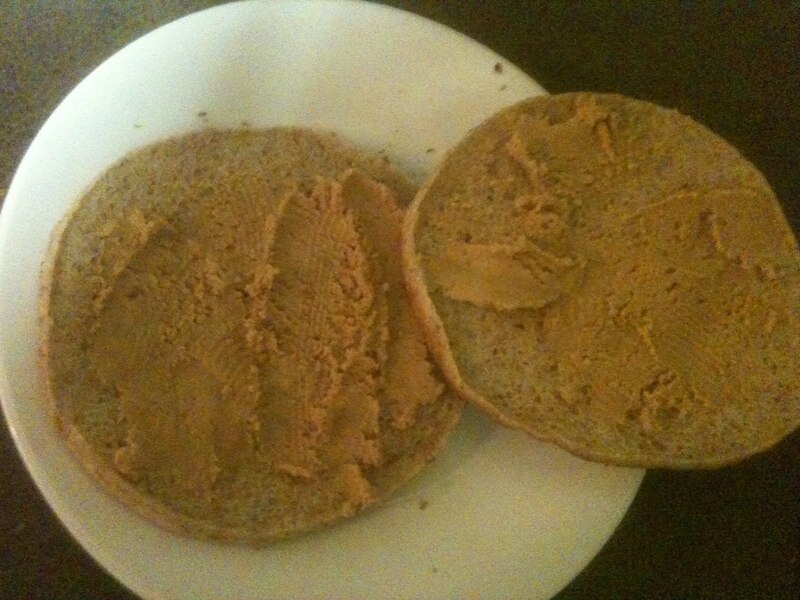 (this may be trick especially if your using natural cashew butter, but remember once sandwich is grilled the heat will allow the butter to melt, so don’t worry if you don’t cover all the sandwich with the nut butter). Now you can use any type of nut butter when making this recipe, Until recently I always used peanut butter, Which is also quite delicious. 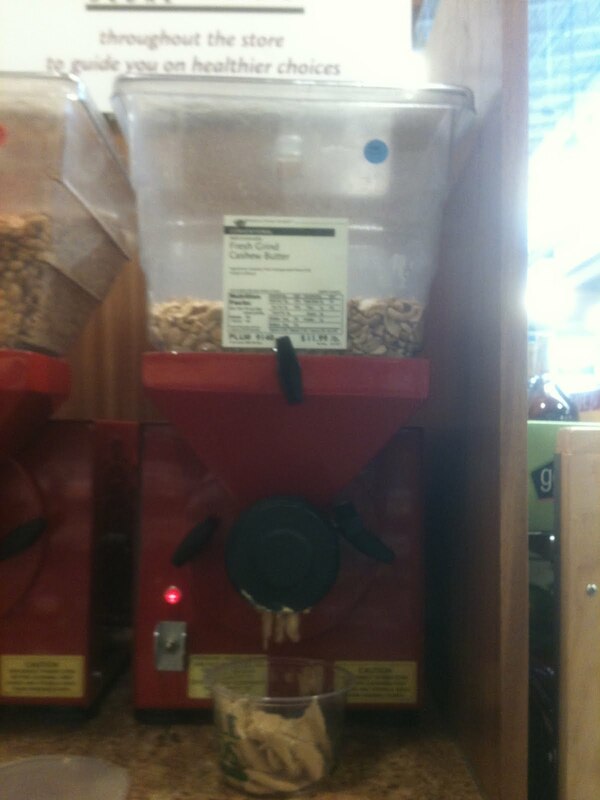 However, my new favorite type of nut butter is cashew butter, I go to Whole Foods and grind up the cashews. The raw nut butter is very flavorful and doesn’t have a dull taste like many other raw nut butters. If you haven’t tried cashew butter before I strongly urge you to try it! Spoon apple mixture over buttered bread. 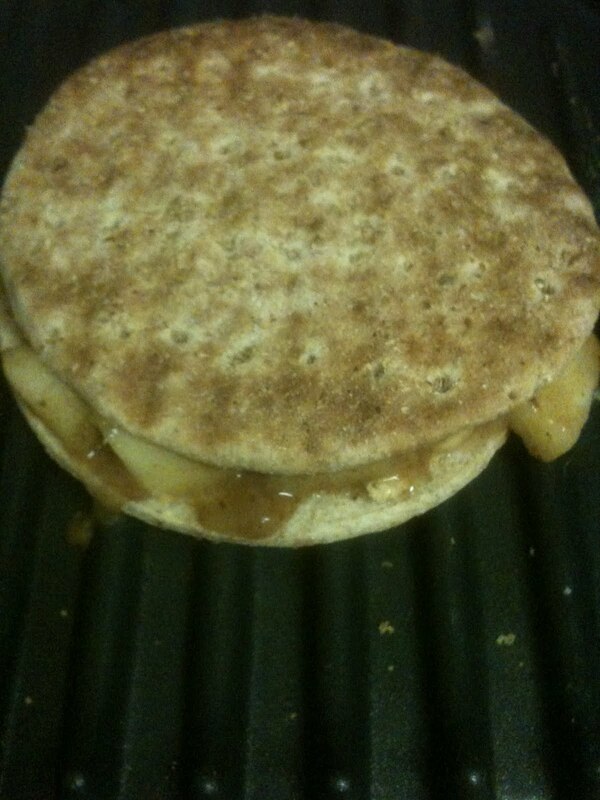 Place in George Foreman Grill and let the nut butter melt and sandwich get warm and toasty. If you don’t have a George Foreman Grill, No worries get creative, use an iron. 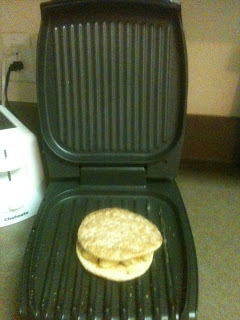 (this is how I toasted several sandwiches freshman year in college) Simply let iron get warm. Place a piece of foil over sandwich and place iron on top. 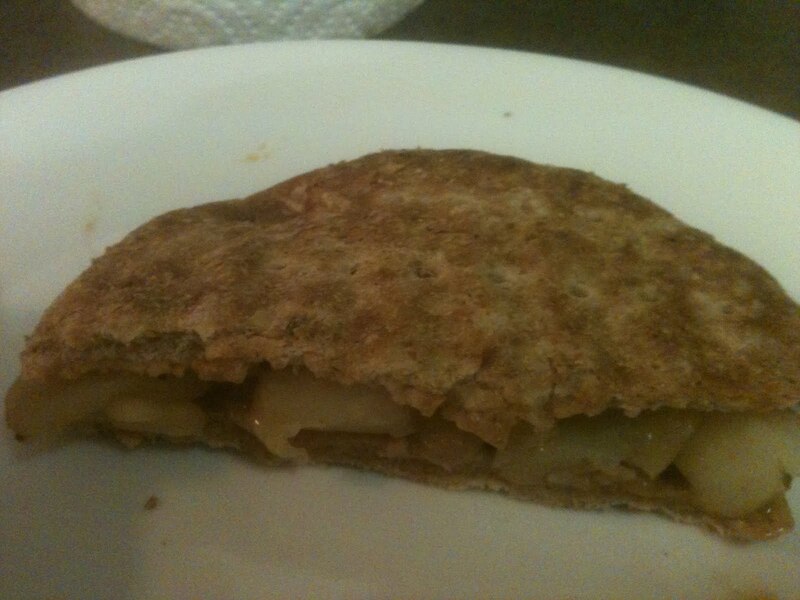 Trust me it works, you notice your bread crisp up and the inside of the sandwich gets warm and melted, Delicious! 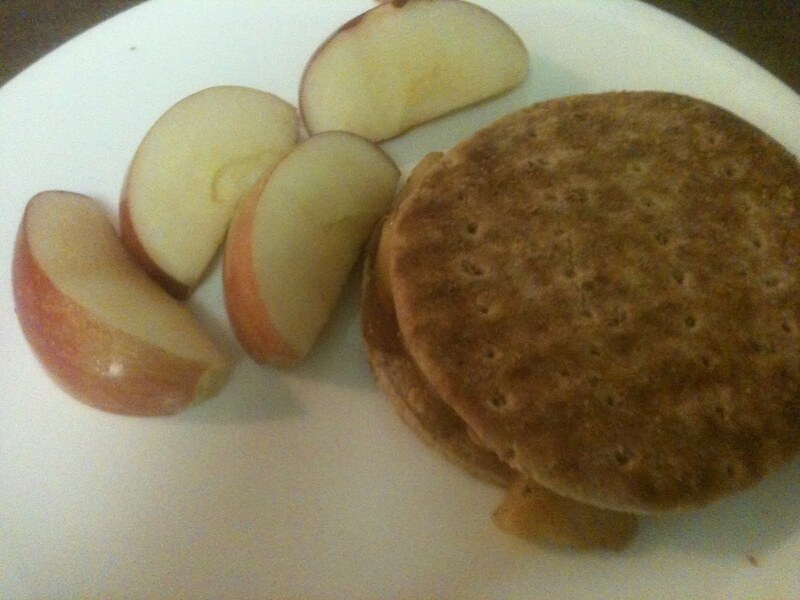 You’ll notice once your done grilling it that the nut butter get warm and begins to melt, this mixed with the warm and gooey apple mixture makes for one scrumptious breakfast sandwich. Serve with remaining apple slices, and be sure to grab some napkins, this can get messy! I made this today and it is AWESOME!!! Totally filling and wonderful flavors. I used the almond butter and I sauted with a little water instead of the cooking spray. It softens the apple and won’t stick to the pan. I can not wait to try more recipes. Thanks so much for this site. Thanks, Jaci but credit for this recipe goes to Kait. Thanks for posting it, Kait, and I’m so glad it helped you change up your son’s breakfast, Jaci! My 14-year-old son has read Eat to Live with me and has made the conversion to healthy eating. He has been getting bored with the choice of “smoothie or oatmeal” for breakfast, no matter how we change it up with different ingredients. This recipe was the ticket! I sent him off to school this morning a happy, healthy and satisfied camper. And, yes, you can modify a recipe to suit how you eat and what you have on hand. The point is the great idea. Thanks Susan! Susan, I think you rock! I love your blog and love this recipe. You have made my journey into healthier living and a vegan life style much, much easier. I have made many recipes from you. My current favorite is your steel cut oats with cherries. YUM! My soap box moment: I hope you don’t listen to the nay-sayers who waste their time and yours with negative comments. Your replies to them are extremely patient! Don’t you ever just want to say modify and adjust people! You are cooking in your own kitchen, for pete’s sake. I am so going to make this! It sounds delicious! The use of cooking spray is always optional. With very good non-stick cookware, you may not need it. Without non-stick cookware or cooking spray, your food may wind up stuck to the pan, but that’s a choice people are free to make. One way to make non-stick spray very close to fat-free is to spray it on and then wipe it off with a paper towel. Very little of the oil will remain on the cookware or in the food. My concern is not the nuts, but many of the recipes on this site call for the use of cooking spray, which is low-fat, but not non-fat. I find this misleading. I understood that all the recipes here could not contain any oils. Oil is the first ingredient in all cooking sprays, but manufacturers can claim they are non-fat if they contain less than 0.5g per serving, which is 1/3 of a second spray. That doesn’t sound very fat-free. Don’t you love people who start griping and whining without even reading? Ugh. Even vegetables have tiny amounts of fat in them, FYI. Traci you probably shouldn’t eat nuts every day. And everything is a source of fat, as nothing is truly fat free. any maple syrup or agave syrup is fine for this recipe, I use what ever I have on hand! Sounds good EXCEPT that log cabin syrup is totally bad for you… Filled with white sugar and corn syrup. Real maple syrup, even though costly, is totally the way to go since it is filled with minerals and taste superior. Yum! Thanks! This sound so delicious! 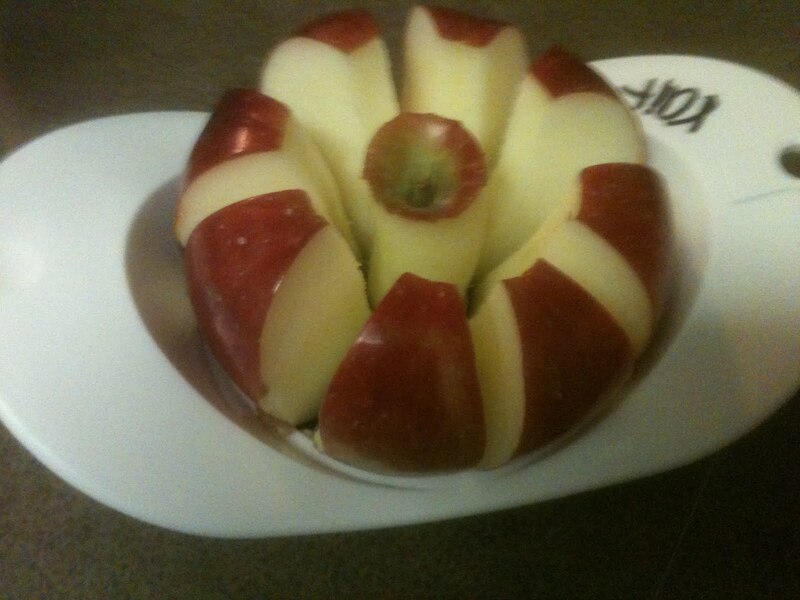 I think I will try it but slicing my apples thin on a mandolin. Yum! My tummy is growling! Your right nuts do have fat in them, but they are a nutrient dense food that is necessary for a healthy body. If you are denying your body completely of fat, you’re actually doing more harm than good. You should have an ounce of nuts a day and no other souse of fat. Did I misunderstand? I thought this website has FAT free recipes. The last time I looked almonds and peanuts have a lot of fat in them. (Unless one can find FF peanuts. The author suggests adding ‘butter’ to thicken the apple filling….it threw me off. Melly, this site allows the use of nuts in moderation, so though this recipe is higher in fat than most it is allowed. And there is nothing un-vegan about it. I thought the whole idea of this website was as a resource for cooking without fat….and VEGAN. 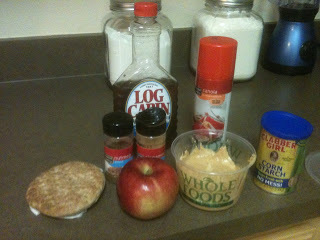 Give this a try it makes for a delicious fall breakfast!